This is my follow-up to the previous essay about FIVE different types of ‘hybrid’ reports. You need to know some background about why I’m writing about this. I’m acquainted with a highly skilled appraiser/instructor of 40+/- years in the trenches. I had the pleasure of meeting this appraiser in glitter gulch in 2008, again in 2013, and we have stayed in touch over the years. I greatly respect this appraiser’s opinions and willingness to contribute cogent remarks in-person, when teaching, and via various forum posts, etc. About a month or so ago, the appraiser called me, and in the course of a lengthy conversation, I was implored to ‘help solve problems’ in our appraisal world, rather than just exposing the problems in my somewhat negative commentaries at times. This appraiser had done so a number of years ago, when the appraiser helped develop a form and format to enable appraisers to more accurately report market info, which had not been done adequately or correctly prior. Sadly, these appraisers are wrong. In case you have not heard, many lending decisions do not need to rely on the outdated 1004 or the 2055. And appraisers are really nice people, when given the opportunity to associate. Appraiser intransigence is why the myriad alternative ‘Hybrid Appraisal Reports’ have been developed. Lenders are trying to figure out how to solve their valuation lending decision problems. But most appraisers do not believe in “hybrid” reports, or do them, currently. Lenders are having a problem finding enough appraisers to fulfill the number of ‘alternative’ reports they want done. However, the fact is, the lenders DO need to have appraisers involved, by providing a signed report for the loan file. In reality, they don’t want Evaluations, BPO’s or other non-appraiser-touched alternative reports, because their regulators want appraisers involved. So how do ‘we’ solve the problem, and assist the lenders? Think about that as I present this additional info and suggestion. We know that a full 1004/2055 is not needed. We know that extreme low cost alternative desktop ‘hybrid’ reports are not being done by many appraisers. So what is the middle ground, to help keep appraisers employed, and to help lenders make lending decisions for non-first mortgage loans and other needs? The solution could be an alternative non-GSE report done totally by an appraiser. This report would have requested data far less than is on the 2055 form – simplified. Additional Addendum and extra exhibits would be limited to keep time involvement shorter. The report would involve an appraiser ‘drive-by’ and photos of a subject property, coupled with a desktop limited data sales comparison grid using only MLS & public data and MLS or assessor photos (without having to drive all comps). Remember, this is a limited SOW Restricted report, not reliant on GSE mandates, which allows the appraiser to comply with USPAP. Maximum of 5 comparable properties, 3 sales and 2 Pendings/Listings. Lenders/AMC’s would have to agree to allow the appraiser at least 7 business days ‘turn-time’ to get the report submitted, after the date of assignment. In this way, the appraiser could schedule the subject ‘drive-by’ to fit into the time frame of other field assignments, and into the office work flow. ROV’s would not be allowed, except in extreme and obvious valuation problem cases. The paid fee for this report would be lower than what most appraisers charge for a 2055, but higher than the current total expenditure for ‘hybrid’ reports, meaning the administration, report prep, billing and bookkeeping is simpler. To make this work, there has to be cooperation among all parties, lenders, AMC’s and appraisers. I would like to ask that a task force be put together involving all parties which would design the actual report form (with help from the appraisal software entities) and determine the acceptable SOW for all parties, lead by an organization that is not affiliated with any particular appraiser association… as a suggestion the Network of State Appraisal Organizations (NSAO) aka “The Network”. The point of this is ‘we’ in this profession need to get out in front of the train, or else we’re going to be steamrolled into oblivion. We’ve got to learn to work together to benefit all of us, lenders included, or else we’re going to have to find other employment, as the work will dry up. I want to help get the discussion going. Re-read the elements above for a Limited Scope Restricted Report, and look at the map below. 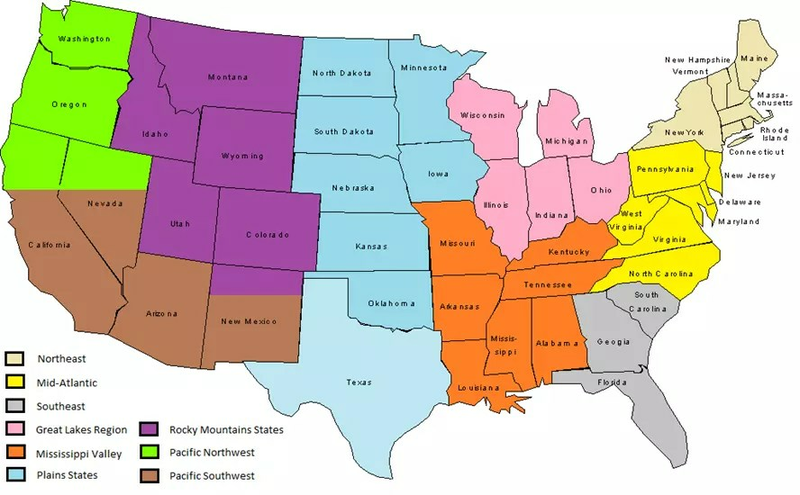 Then, find your location on the map below (note that several states are divided by region), decide what would be your AVERAGE fee for the suggested report, and send me back a message (by Wed, Nov. 29) identifying your region and the Average fee. (Alaska in Pacific Northwest, Hawaii in Pacific Southwest, and Puerto Rico in Southeast). I’ll compile the results and make a report available to those who can work on a task force and/or various appraiser publications. I WILL NOT REVEAL ANY RESPONDING APPRAISER TO ANYONE ELSE. This also is not to be construed as any form of Price Fixing, it’s merely a survey. Dave, I’m not sure if you’re still collecting fee data but for $250-300 I’d do it based on the SOW stated above. I’m in Mid-Atlantic. Clearly, you haven’t been in the profession long enough to try to make a movement to degrade the standards that all licensed and designated appraisers are and have been held to for many years. A history lesson for you is required. Why did the American Institute of Real Estate Appraisers (AIREA) begin establishing education, standards and ethical canons that were eventually adopted by USPAP? When did they do this? Answer: After the Great Depression when banks went belly up and crashed the entire US economy and so many people in every industry and profession suffered for lack of jobs . What happened that helped make those educational opportunities, designations, training of apprentices and high ethical standards be accepted by the entire profession? Before you consider trying to reform the profession, you need to ask yourself why are we having the problems we have in this profession? I would say the lack of adherence to high ethical standards, lack of experience under senior appraisers (due to licensing), and people pleasers who owe their living to banks who will not stop injecting politics into our profession by paying lots of money to lobbyists who write law for the lazy and corrupt politicians who call into question all appraisers as if we all are corrupt, incompetent, uneducated and inexperienced. When the Appraisal Foundation has neutered the only professional appraisal organization, The Appraisal Institute, and claims they are the “foremost experts in real estate appraisal”, that was when I knew they were disrespecting the only real organization that has consistently contributed to the education, training and high ethical standards that ever existed in the profession and that they caved in to what the bankers want. You better re-evaluate your goal; if you think you are qualified with your “ghost” appraiser giving you advice I suggest you will be appreciated by banks who always wanted to circumvent the appraisal process and realtors who are interested parties who never wanted to lose a deal and they joined banks in lobbying to get rid of us. For myself and I believe many other appraisers, I predict you will be alone in your efforts to further degrade our profession when they are appraisers who have earned respect from their peers. It is never ok to inject politics into an appraisal which is an unbiased opinion. Your need to be a people pleaser appears to have clouded your judgement. I sincerely hope you fail and that appraisers who are reading this do not contribute any information on what fees are fair to lower the current standards for complete appraisals. If you think a drive by is adequate to secure a loan for real estate, you should lose your license. Well put and your message is much more along the lines of where the industry is quickly headed. There are already places where there are no apprentices nor mentors available to the industry to service the current appraisal / valuation needs. The appraisal “shortage” has been well analysed in every way the past year or so and there is no appraisal shortage. The problem is, there are no appraisers in certain geographical areas and there lies the crux of the bigger problem as there simply will be no quick fix to that. The amount of time needed to resurrect the status quo of the appraisal industry can not happen quick enough and other methods are now needed to bridge that gap. The bifurcated process allows risk inspectors or home inspectors to do the driving and they are already well suited to do so. This allows the valuation expert to be just that and this will be done on more and more as there gap in coverage grows but, also in the sense that in becomes a more efficient process. The communication and even education between all parties is paramount as there are new processes to follow that will effect all who plan in being in this valuation game. No not true, false presumptions. Pay me! Show me the money! I’ll be there in a heartbeat and will train anyone. The status quo which is a problem, is the notion that appraisers are not a highly effective free market force to themselves. The prohibitions laid down by excess regulatory structure is a key consideration, leading once again full circle that the size of the government and the continued meddling in this industries regulatory structure plays a strong role in constricting the ability of free market participants to engage. I’m your new relocation appraiser, get me a license waiver, pay me the premium fees, I’ll be your man and will train your selected persons. Can not happen quick enough? By what measurement? Let them fail, the invisible hand will move and another whom can source talent will fulfill the market demand. If they’re on such limited revenue they can’t afford the talent, they’re on the way out anyways. The sooner the better. All I need to do hybrids is very simple. I must know the individual and business names of everyone involved who’s opinions, photos, data, or conclusions I will have to rely on. I must know full detail in a transparent manner. I must be able to make informed business decisions and have transparent disclosure on total fee distribution so I can assure I’m getting my fair share and am not participating in a ponzi scheme or improperly imbalanced engagement which deprioritizes the worth of my worthy license, or one which improperly distrubutes the fee in an imbalanced manner. And a key point; The lender must coordinate with my insurer and in unison they must both agree the product is acceptable and covered under my insurance. Then I’m in. I’ll need to maintain a minimum of 60 dollars an hour hopefully more, and I will determine my own wage based on my actual time expenditures. Time estimates are irrelevant, I will bill based on my time and the fees will fluctuate, just like with 1004’s. Same program, scaled down engagement model. Lenders are not promoting waivers, avm’s, and hybrids to save money or to save time. They’re promoting this to lift the valuation duties away from the licensed ethically constrained appraiser and put that in the hands of advocate minded tech people. They are making it purposefully difficult to engage so they can then argue the newly founded illusionary point of lack of coverage and seek further regulatory exceptions for themselves. You say they can’t find enough appraisers to do these types of reports…hmmm.. wonder why. Because this all comes down to MONEY and to say we appraisers are not smart enough to figure that out is insulting. Kudos to you Dave if you want to work on this junk more power to ya. From my experience every time I turn down one of these types of reports @ $65 the client calls me to ask why. Informing them again and again we do not do these. Ten minutes later a 2055 will come in for the same property at a fee of $350. Hmmm… I wonder why they are unable to find enough appraisers… Let’s see $350 – $65 = ?? or might it be we know junk when we see junk! Sounds like this was written by one of those “establishment type of appraisers “. Remove the AMC, allow MLS photos to be used as long as they can be verified to be accurate, streamline the form, bring back the summary report, require that the Tidewater rule be initiated when sale price cannot be justified or for refinances allow an additional (3) comps MAX that can be provided by the client for consideration. Run it like the VA runs there program. Its efficient, the folks at VA support you and don’t throw you under the bus when you are in the right ( unlike AMCs do ) because they want what is in the best interest of the veteran. This will speed up the process and reduce costs, big time. Oh, and did I say remove the AMC from the transaction ? Pattie, not bad ideas but let me ask one question. Why cant the listing agent or seller or owner provide the data they’d submit under Tidewater RIGHT UP FRONT – not later than the appointment? Why must there be a post appraisal hand holding period at all? Also, whats the procedure re fee when you call someone and say – Value isn’t happening from data I’ve reviewed. Can you supply alternatives? Do you still get paid FULL fee even if they cancel at that point? (like often happens) if they decide to relist and go conventional instead – or do one of those phony FNMA 97% LTVs and just add the added costs to the price – knowing they can just get a trained sealer low ball hungry appraiser to hit the number?. Mike, take the comps up front. I do anyway. I don’t “call” any one for purchase or refinance. For purchase, I stop what I’m doing, send an email to the lender, tell them I need assistance in the form of comps that will justify the contract price. Give them 48 hours to submit. No wait, lets give them only 24 hours to speed up the process. After 24 hours resubmit discussing any new comps and why I did or didn’t use them. For refinances, if they have comps up front take them consider or discount them, complete the report and submit. If they want a reconsideration of value then complete a reconsideration of value in 24 hours to “speed up” the process. That’s it and have a blessed day !! Move to the next assignment. Repeat. No calls. Collect non loophole, actual customary ( that did not use bogus AMC fees in the survey ) and reasonable fee in 30 days. Im slow Pattie – followed most of what you said but unclear on parts. Is it Tidewater that requires you to email the lender rather than VA or AMC? (I dont do VA so I, fuzzy on the requirements there). Am I quibbling over the verbiage “tell them I need assistance in the form of comps that will justify the contract price.” …instead of just saying market data I have doesn’t appear to support price? (If Im correct telling them there is an issue with value is a requirement of Tidewater, right?). Who decides how long they get to submit new data? Is that set by VA or by appraiser? What happens if they have no comps? • Check the Appraisal Request form (VA Form 26-1805) in block 30 for a Point of Contact (POC). If none indicated then contact the requestor (at the bottom of the form). Advise that individual ONLY that you are requesting any additional data that they (or the buyer/seller/agents) can provide, to ensure that you have considered all pertinent information. You should AVOID any discussion of the value estimate. • The POC or requestor will have two workdays to respond. • Additional information (if any) sent to you should be in a format similar to the comparable sales grid (i.e. page 2 of the URAR) including verification of the sale. When pending sales contracts are submitted (especially to support time adjustments) they must be complete with all addendums attached. A narrative should be included describing the similarities and differences between the pending sale(s) and the subject property. • Review and analyze all data submitted, then complete your final report based upon your finding. If you are able to increase the value estimate to meet or exceed the sale price, then comment to the extent of this process used and the (extra) time needed. • If the final value estimate is still less than the contract price even after review of additional information, then comment on the source of the additional information, what was provided, the results of your review and analysis, and the (extra) time needed. They also have a 110% ltv allowance with their guarantee program to accommodate that sort of lenient behavior. Just saying. Congrats Dave – they got you!! How about we tell the Title Company we will give them $50.00 to do a lesser search? Tell the lenders we will give them $50.00 to do the “transaction”. Realtors get $500.00 for their input max. We are closing on a house and the Title Company told us 30 days after contract signing!! They should get 10 minutes to get the paperwork ready. Attorneys should get $50.00 for doing their due diligence. Why are we the problem? Since 1993 I have not got a report in late enough to stop a closing. Our fees have been competitive. As a matter of fact I have never had a complaint over fees or turn times. Do we get low ball with impossible turn time requests – absolutley! We say NO. We are an easy target because we are not represented well. AI dumped us long ago. The “Network” should be joined by all. Sounds like someone is drinking the koolaid! We are professionals and can see through the BS! If you want to do these reports, go for it! Any appraiser with an ounce of credibility and respect for the profession won’t touch them… and with good reason! The problem is self-created on the part of the client. The solution is very simple: Pay a fee commensurate with the work involved. Why is anyone going to provide an appraisal service for less than the price of a no-show fee, or a final inspection? Last year during the rush I was getting 250 for finals, but that’s back to the standard 150 now. I had a drive by 2055 volunteered to me at 450. Sure dude, wow, who have you been on the phone with and please call me more often. Everyone these days seems to have bought into the idea that checks and balances should be optional, only necessary for lenders risk and not consumers risk. As if a consumer with 50% equity does not deserve equal protection as lenders. The original reason for regulation was to protect the citizens access to lending, not to protect lenders themselves. Everyone has drank that kool aid. Those checks and balances systems should only be implemented when lenders take risk, consumers are expected to trust the lender without such protections? This goes against the very spirit of lending regulation in the first place. That’s a lie, fail. There is prudent underwriting then there is this new thing, robo underwriting. If the auto tools allow a single reviewer to ‘review’ 40 appraisals a day, how many do you think their daily quota will be with hybrids? This is like factory chickens on hooks, the inspectors for chicken have to ‘inspect’ 140 of those bad boys a minute. And so will go hybrids, the people who profit from them will push them out at absurd rates, rates they themselves can’t even apply quality standards to. If they get hit with sending too many through, they’ll just raise the allowable rates or decrease the inspection standards. This hybrids deal is shaping up a lot like factory produced chickens, or is this just me? Dave ~ I don’t think this format is going over so well. I would also like to know the name of the appraiser who saved us all and advises you that appraisers are “wrong”. As a friendly reminder, appraisers weren’t wrong sending warnings before ’08, and they’re not wrong now. Post crash, lenders can’t manipulate markets on the origination side like they did thanks to QM. Today, there’s a new attack angle and it’s on the value side. Volume is down, they want control and they want it now. I want to train apprentices but how can I under these conditions? Go back to your source and explain to them that lenders need to allow our own trainees. Pay appraisers properly, and all will be good in the world of housing finance. We will serve them professionally and honorably. I realize being professional and honorable is difficult for AMCs to fathom, but wow ~ what a concept. I attached a sample hybrid request. Please explain to me how appraisers are to value a property as repaired when they don’t know what the repair items might be? Then, please also explain how appraisers are supposed to perform two appraisals for $185 and be in business very long? The entire concept is wrong on so many levels. Here is one last bit of information for everyone. Consumer attorneys are aware of all these shenanigans and waiting in the wings to cash in again. When calculating risk, perhaps it’s something these “innovators” should consider.